Eli Stone: Brilliant Musical Fantasy on DVD! This is an amazing, wonderfully written, piece of modern fantasy. Where else could you watch a show where a dragon could fly down the streets of San Francisco. I absolutely loved the first season and am thrilled that I can now get it on DVD or through . Eli Stone is about a power amoral lawyer in San Francisco who is on his way to getting partner in his law firm. He is driven to win and does not stop to think about how he wins just merely that he does win. One day that all changes when Eli hears George Michael Singing in his head. The visions haunt Eli and direct him to help people. The visions takes the form of people around him singing songs that can give information about future events and people. It turns out that Eli is suffering form a brain aneurysm which leaves him wondering if the songs are a natural cause of his condition or something from a higher power. Eli Stone is also a musical because of Eli's condition there is music in every episode. Although there is a lot of George Michael, which I love, they also have many other songs sung and danced to. What is wonderful is the fact that it is all in Eli's head but we get to see the song and dancing from his perspective so as the show progresses suddenly one of his coworkers and at times the entire office breaks out in song and dance, Brilliant! This show tackles religious, metaphysical and political issues but does so in a manner that is not preachy and often will use not taking a side as a device to create tension in the story. The best example is with Eli's singing, the writers will but forth a perfect argument that it is from a divine source, though not declaring a particular god, and a perfect argument that it is the machinations of a medical condition. It's amazing how the show can delve into so much spirituality and metaphysical topics without overtly picking a religious side, kudos! This show is highly recommended and a must own. I can't wait to see what they will do with the second season. 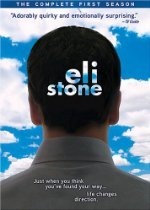 Get Eli Stone on DVD or through .